CD was about 2 years old, When he came to us. He was a very shy/fearful dog. 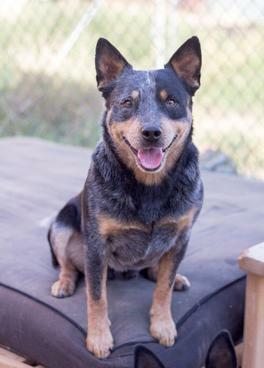 CD was born on a property that had more cattle dogs then you can count, But he is a tough dog and became one of the dominate dogs on the property. CD was known as Cuddles by the landowners wife. When she would come home from work he would stay by her side. This was his routine for about 2 yrs. Then the husband had got really sick, and needed help with all these dogs. 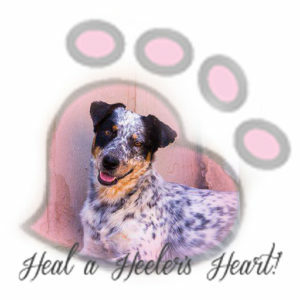 Heeling Heelers Hearts was contacted and asked if we can take some of these dogs. We where first told that there was about 40-50 dogs on this property. Man where we in for a shock. On September 12th 2015 we made the 4 hour drive to Wilcox AZ, In a uhual van we rented, loaded with wire and plastic crates. We get to the meeting place with Nadine and a Sheriff’s deputy. We drive another 15 min and we are finally at the property, there was not 40-50 dogs, never was there was over 200 + cattle dogs. There was already 34 moms and pups removed. We took 20 dogs and brought them home. They where in good weight some had skin issues, but over all in pretty good health. We also took a 3 wk old pup that we named Ollie, he was infested with fleas as well as the other dogs. Poor Ollie was pretty sick, the fleas where so bad that he had 20% blood left in his little body. We thought we would have to do a blood transfusion which it would have been 800 to 1400 dollars, We where like how are we going to pay this. We spoke to the vet in great lengths about what to do, since we didn’t have that kind of money. We did a lot of homopathic remedies to boost his system, and antibiotics, good food, lots of rest. Ollie pulled through and was a spunky puppy, and was adopted that dec. Back to CD, he was finally coming around to where if i sit outside he would sit next to me and i could pet his chest, He loves cheese. It took me from sept to the end of Jan to get a collar on him. I then took him through 2 training classes. I had him listed for adoption. But that didnt work out so well, We where doing a 30 day trial with foster with intent, well it didnt turn out so great, the guy didnt listen to anything i said and he got himself bite in the hand. And after having 5 other people inquire about him and turning them all down, for being out of state, having young kids, CD has never been around kids. and other things. I decided that i have put a lot of time and hours of training that he was not going to go any where, See when CD would get nervous he would fear bite. But he is home safe and sound.